Everyone faces financial emergencies sometimes. When a major appliance breaks down, a surprise bill arrives or a family member unexpectedly ends up in the hospital, you may be forced to turn to unpleasant options to get the cash you need fast. One option you may consider is a cash advance loan—also often known as a payday loan. While they do provide you with a fast injection of cash, these loans can be dangerous. Nearly every payday loan features high interest rates, steep fees, and punishing terms. Only those who are desperate for short-term cash would consider them, but that may be the situation you’re in right now. You should consider some common sense tips before you sign your name on the line. If you don’t take the proper precautions, you could find yourself paying for your “short-term” loan for a very long time. 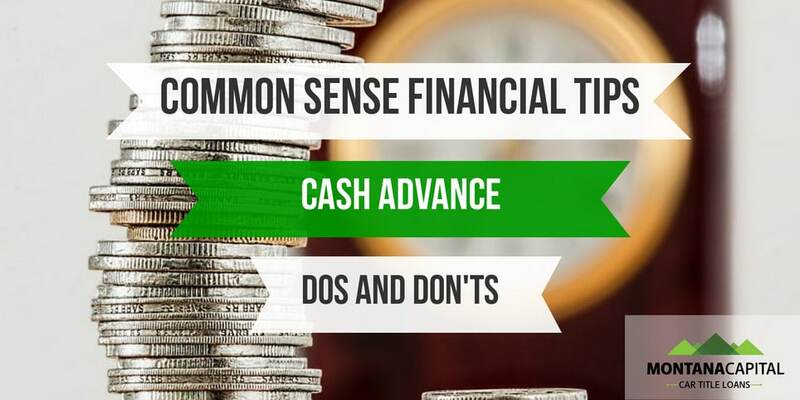 Before you get a cash advance loan, make sure you’re aware of what you should and shouldn’t do. Explore all of your options before you apply for your cash advance loan. If you can, avoid taking out a loan at all. Don’t be too proud to ask friends and family members for a short-term personal loan. Most people never want to see their loved ones trapped by payday loans. As long as you’re serious about paying the money back, these loans come with far less risk to your family. You can also look into having some of your bills delayed. Your landlord may be able to cut you a a little slack until your next paycheck arrives. Your mobile service and internet provider may send you some grumpy notices, but will often leave your services on for up to two weeks after a bill has passed its due date. One month of late payments aren’t likely to do as much harm to your credit score as getting trapped by cash advance loans. Make sure that you also consider all the other loans that are out there. You may qualify for a much lower interest loan through your bank. You can also explore secured loans, that have much friendlier terms because you’re providing collateral. It’s much better to have a “hard month” than to take out a payday loan. You may enjoy your fresh coffee from the bistro, getting takeout for lunch and relaxing with your paid cable or Netflix subscriptions, but if going without all of those things for just long enough will create enough room in your budget to avoid a cash advance loan, it’s probably worth it. You may be surprised at how much you can save if you become really aggressive about making room in your budget. Make room by canceling every subscription you can think of, from magazines to music. Switch to generic groceries and cut every coupon you can find. Remember, it only needs to last until your next paycheck arrives. You can’t borrow more than that amount with a cash advance loan, anyway. There are few situations more financially dangerous than cycling cash advance loans. This happens when you must compensate for the money you lost to the first cash advance loan by taking out a second one after the first. This rarely happens only two times. Instead, those trapped in the cycle must continue taking out cash advance loans every month for months on end. When this happens, you are paying massive fees in order to access your own money. You will always receive less money than you would from your paycheck, so it can be very hard to escape. You may be thinking to yourself: “there’s no way that I could be trapped in a payday loan cycle”. You may have every intention of making it through the next month without getting a second one. But remember, an emergency already happened once, and it could easily happen again. When you’re considering whether or not to get a payday loan, never overlook the fact that you can’t control the rest of the world. Your best-laid plans for paying back the first loan may blow up in your face and leave you stuck in the cycle even if you think you’re too smart for it. So, think long and hard about whether you really need that cash advanced right now.